Within a few years, we'll be able to take clear pictures of objects through clouds, smoke, or fog. We'll do it using quantum entanglement cameras. How do you translate theoretical physics into photography? 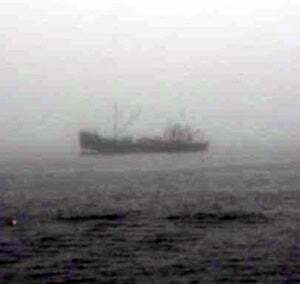 Imagine you are trying to photograph a boat behind a bank of fog. You'll use two light-sensitive devices: aim one at a light source that's illuminating your fog-shrouded boat (such as the sun, or a searchlight); then aim the other where you think the boat is likely to be. Then you use a computer program to combine the patterns of photons you've received from the object and the light. Once the two patterns have been compared, you get a kind of black-and-white silhouette of the object you want to photograph. Scientists call this a "ghost photograph." University of Maryland physicist Yanhua Shih has been working on this "ghost photography" for a while, and has been talking to the military about using it in UAVs for photographing bomb damage through smoke. Albert Einstein explored the basic research behind ghost imaging — quantum entanglement — which he called "spooky action at a distance" in 1935. Shih discovered ghost imaging in 1995, but the theory has yet to leave the laboratory. Air Force satellites could use ghost imaging by pointing a light sensor toward the Earth's surface and another toward the sun. The technique could allow the service to penetrate clouds or the smoke that follows airstrikes . . . Defense manufacturer Lockheed Martin has shown interest in quantum entanglement, acquiring a U.S. patent in May to develop quantum radar that could defeat stealth aircraft and find camouflaged improvised explosive devices and mines, according to the patent. I'm still unclear on how this works if you don't know the precise location of the object you want to photograph.